Zinalrothorn is one the most beautiful mountains in the Alps, especially from the south where it's looking like a needle. 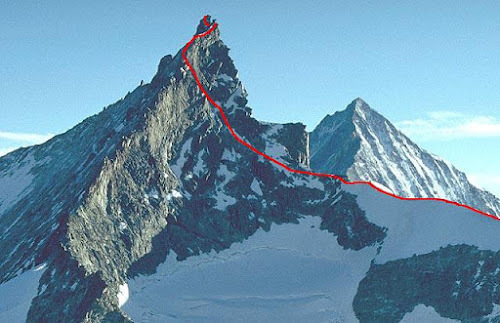 The technical difficulties on the normal route is AD (approx the same difficulty as Matterhorn that I climbed two days later). The Biner slabs on the upper ridge can be difficult and exposed in icy conditions. Here we had to use crampons on very mixed ground. However the main danger is the frequent rock-falls in the couloir from the snow-ridge and all the way up to Gabel's notch. The rock-falls in the afternoon are also bombarding the glacier just above the hut, rocks that can be the size of a car. On the the way down it was a terrifying sight to see all the big rocks that blocked the path we had taken in the middle of the night. Speed is safety, hence I ran like a mad man to prevent being in the wrong place at the wrong time.